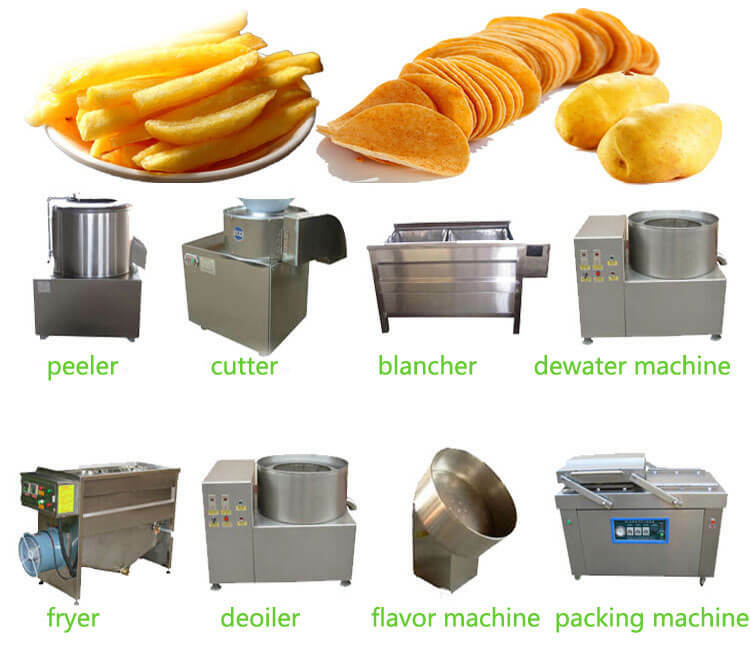 As a kind of worldwide popular snack, fried potato chips producing is certainly in large demand. 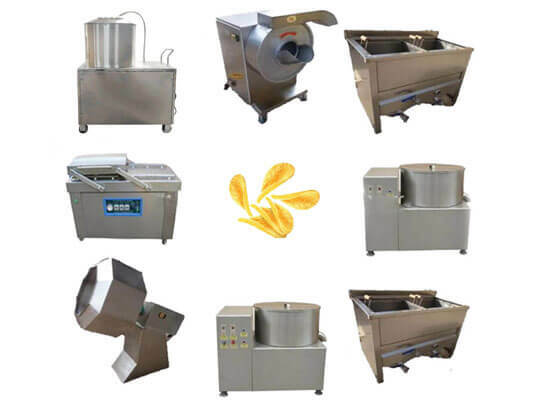 Amisy food machinery supplier offers several potato chips production lines which contain fully automatic plant and semi-automatic plant. Our semi-automatic plants consist of 8 independent machines with the capacity of 30kg/h, 60kg/h, and 150kg/h. 1. Washing and peeling is the first step. Potato washing and peeling machine is specially designed and no damage to potatoes. Then it discharges potato strips automatically. 2. Equipped with sharp blades, potatoes are cut uniformly and evenly by potato chips machine which can also process carrots, sweet potato, and other root vegetables. 3. Potato slices blanching machine is to wash out the starch on the surface of potatoes and avoids the potato chips sticking. 4. Then the dewatering step is to help reduce moisture and make them easy to fry. 5. Frying can reduce the moisture to 2% and get the crispy potato chips. We offer the pure peanut oil and change the continuous working oil every 8-12 hours. 6. The fried potato chips are placed on the draining oil belt to fish out the spare oil. 7. The flavoring machine is used for seasoning the fried potato chips. Which flavor is needed totally depends on yourself. 8. Vacuum nitrogen packaging machine is ready here to ensure the high efficient packing. As fried potato chips are fragile, the nitrogen is necessary to keep food fresh, tasty and without damage. 1. Little edible oil use, low fuel consumption. 4. A variety of processing capacity for your choice. ☆ This plant area for the capacity of 30/60/150kg/h is respectively 50/80/150㎡. ☆ The formula should be added during the blanching process, suitable blanching temperature is 70℃, blanching time is 7-15 minutes. ☆ One work can operate 2 sets of machines. ☆ Provide customers with formula( free of charge) for making crispy potato chips with the golden color. ☆ Specialized personnel offers the professional training class for operators. The Itch for Potato Chips Investment? This May Help You! Here are demographic studies that prove to be very predictable when it comes to human behavior, especially concerning our purchase habits. Generally, couples marry and have children at the age of 28. Children consume the most food at the age of 14, especially snack food like potato chips. Therefore you can assume that the most potato chips will be purchased by a family household at the age of 42. So the grocery stores in neighborhoods with a younger demographic will have more potato chips than a store in a more mature neighborhood.